CellMosaic has designed this kit for antibody (IgG) labeling of monomethyl auristatin F (MMAF) with valine-citruline p-aminobenzylcarbamate (VC-PAB) (a releasable linkage). MMAF is a new antimitotic auristatin derivative with a charged C-terminal phenylalanine residue. The kit includes maleimide-activated MMAF (Mc-VC-PAB-MMAF), which can be coupled directly to the antibody after reduction through alkylation in a single step (a method developed by Seattle Genetics: Sun et al. 2005, Bioconjugate Chem. 16, 1282-1290). The product is purified to remove any unreacted drugs. This kit provides materials to conjugate MMAF onto one (CM11425) or three (CM11425x3) antibody samples (IgG only). Scale of the reaction: 3 mg. Mechanism of action: Inhibits cell division by blocking the polymerization of tubulin. VC-PAB linker is stable in extracellular fluid but cleaved by cathepsin B once inside the tumor cell, activating the antimitotic mechanism. To estimate the DAR, you can obtain the UV absorbance ratio (R) of your conjugate at 248 nm and 280 nm. 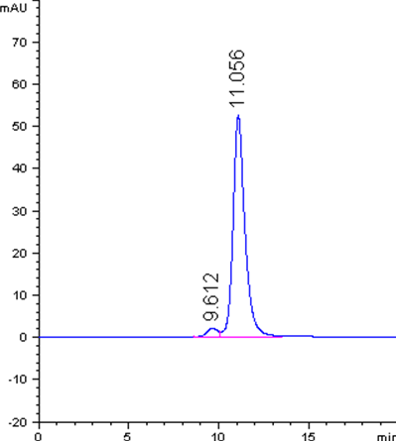 The unlabeled antibody will have an R value of 0.4 – 0.5. An MMAF-ADC with DAR of 3 – 5 will have an R value of 0.65 – 0.80. 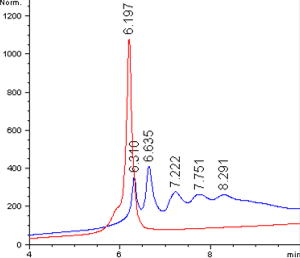 Note: The UV absorbance of the MMAF in an ADC can vary greatly depending on many factors, such as aggregation and stacking. Therefore, the R value for an ADC can differ greatly for different antibodies and should be determined experimentally. The calculation for the DAR using this formula is only for reference only. For more accurate DAR calculation and to check the homogeneity of the ADC, you can analyze it by hydrophobic interaction chromatography (HIC). If you do not have access to such a facility setup, you can send your sample to CellMosaic for analysis. Mc-VC-PAB-MMAF is very hydrophobic. This kit is designed to minimize the aggregation and precipitation issues generally seen with MMAF labeling. However, you may still notice some solid precipitate out or ADC aggregation during the reaction. The precipitate will be removed during purification. Depending on the properties of your antibody, recovery will be 40-80%. 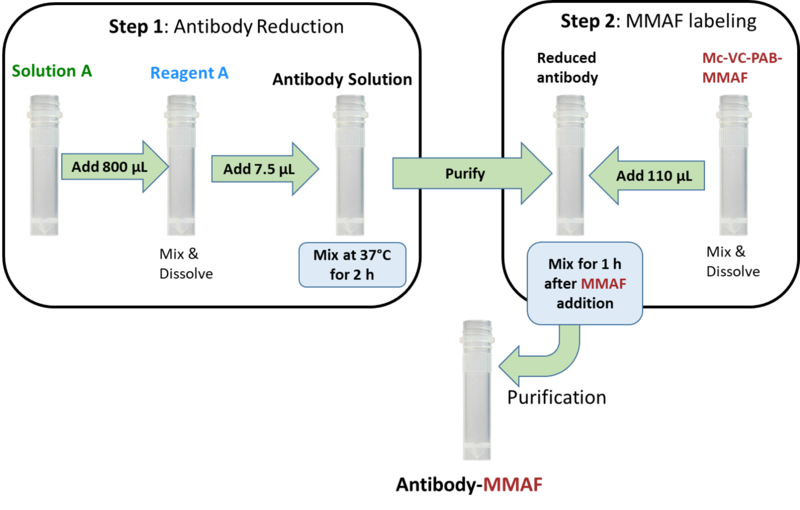 If you are concerned with the aggregation, you can use size exclusion chromatography (SEC) to check the extent of aggregation. If you do not have access to such a facility, you can send your sample to CellMosaic for analysis. Click the button below to add the Antibody MMAF Conjugation Kit (with VC-PAB Linker) to your wish list.